The perfect way to see Florence in a day; exploring the most famous sights of the city plus those hidden nooks & crannies that make it so special. With the help of our friendly local guides you won’t just see Florence, you’ll truly appreciate it. 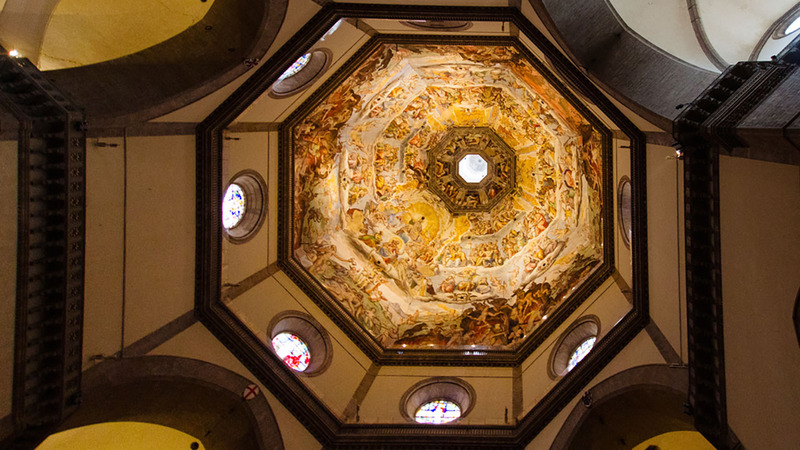 You’ll visit Florence Accademia to see Michelangelo’s ‘David’; the Uffizi Gallery for works by da Vinci, Raphael & Boticelli; explore Florence Duomo with its stunning dome; and enjoy a guided walking tour of the city. We’ve arranged express access and pre-reserved tickets at all the sites. And with group sizes of 20 or fewer, guaranteed that you have a relaxing, engaging day. 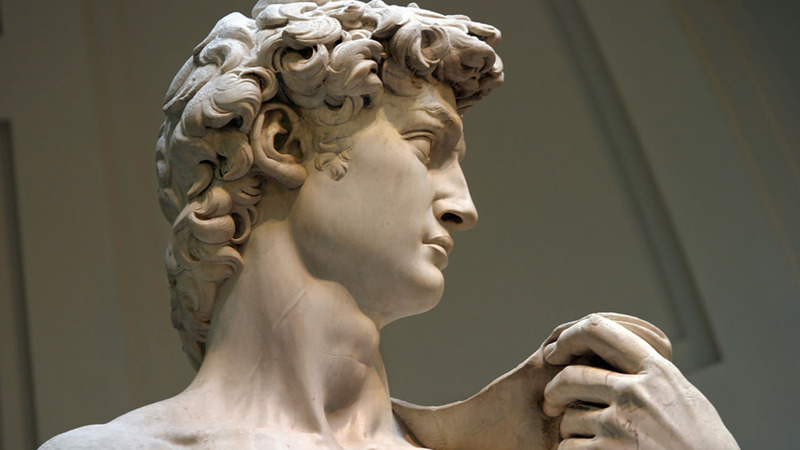 Your full-day Florence tour starts with a bang at the Accademia Gallery. After skipping any entrance lines, you’ll meet the city’s most famous resident – Michelangelo’s ‘David’, whose beauty and size must be seen to be believed. Your expert guide will teach you about the enigmatic genius behind the sculpture and give you rare insight into his methods with a visit to the unfinished ‘Slaves’. 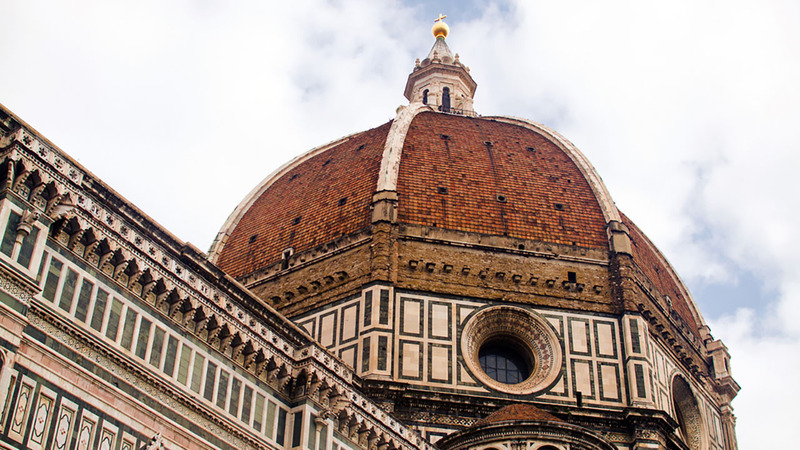 The next stop on your full-day Florence tour is the Florence Duomo. where your guide will tell you the story of its enormous dome and how it went from a near catastrophe to the greatest building achievement of its age. You'll also see the Florence Baptistery, home to the set of bronze doors that were thought so beautiful, Michelangelo called them the "Gates of Paradise". N.B., The Florence Duomo does not offer skip the line tickets so unless the entrance lines are very short, we do not step inside. If you do want to go in, your guide will give you some tips on when to go in order to beat the lines. The adventure continues with a breezy city stroll through the streets of Florence to admire its outdoor artworks, piazzas, bridges and pretty side streets. 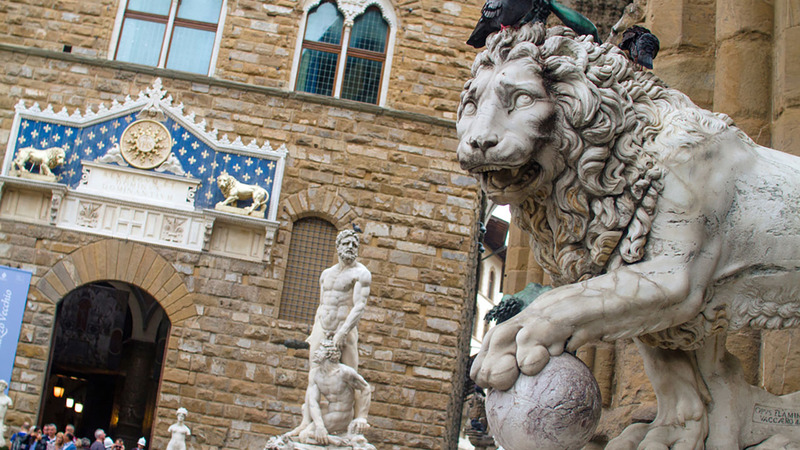 As you walk, your guide will bring the streets to life with stories from Florence’s checkered past – from the beloved Medici family to feudal battles, self-defense in Medieval Florence, philandering kings and Renaissance masters. You’ll visit famous sights like the Palazzo Vecchio; discover beautiful outdoor sculptures at Piazza della Signoria; hear how the old Roman forum became the Jewish ghetto at Piazza della Repubblica, and learn what all those characters sculpted along the walls of Orsanmichele Church really mean. Lunch is not included so your guide will point you in the direction of some of their favorite local spots where you can eat real Florentine food, then it’s on to the Uffizi Gallery, where we’ve pre- reserved your express entrance tickets. Organized chronologically, the Uffizi collection offers a rare opportunity to watch art develop through the ages. Your guide - a passionate expert on Renaissance art - will take you hrough the ages so you can see the flat, 2-dimension paintings of the Medieval era blossom into beautiful 3-dimensions of the Renaissance. Highlights include masterpieces by Raphael, Leonardo da Vinci and Boticelli’s ‘Primavera’ and ‘Birth of Venus’. Your Uffizi tour ends inside the museum, leaving you with the option to stay inside for longer and discover more of the gallery on your own, using the tips and tricks you’ve learned from your guide. With small group sizes of only 20 people or fewer throughout, you’ll find that, despite taking on the mammoth task of seeing Florence in a day, your full-day Florence tour will be relaxed and easy-going, your guide easy to hear and engage with. Because, if you ask us, it’s not enough to just see Florence, your visit will be wasted if you leave without truly appreciating it for its world-class art, fascinating history and stunning architecture. Mat was awesome!! Very knowledgable and friendly. So passionate about his work. Mat was one of the best tour guides we've ever had. His passion for the arts was palpable and you could tell he really loved what he was doing. Compared to some of the other tours we did in other cities, there was no comparison. Excellent tour! Teresa is a very knowledgeable and personable guide who is passionate about Florence and it's history and art. Great with the kids in our group. Loved every minute of it! Our guide was very knowledgeable and we enjoyed the tour very much!! I would definitely recommend and use Walks of Italy again. Please note that your guide will not be with you during your lunch break (aprox 1.5hrs), but will, of course, give restaurant recommendations and point out where you need to be for the second part of the tour. 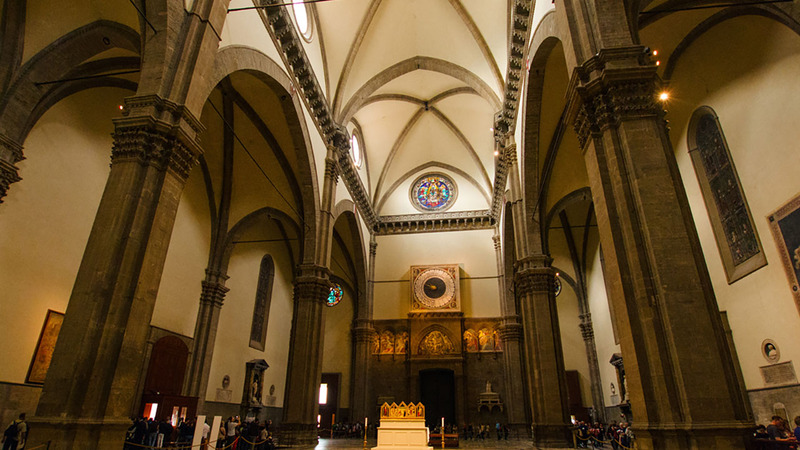 We advise our clients that the Cathedral of Florence is subject to closure during special celebrations/festivities, including the Easter ceremonies. If this occurs during your visit, we will run an alternative itinerary that includes and explanation of the Cathedral from the outside and extra highlights of the city center. We are unable to provide refunds or discounts. In some cases it may not be possible to enter Florence Duomo on your guided tour due to long security lines. At these times your guide will give you an explanation from outside and leave you to visit in your free time if you wish. Larger backpacks are not allowed into the Cathedral, please make sure to only bring small handbags on this tour. Additionally, please make sure to dress appropriately, as this tour enters a church. Knees and shoulders must be covered while in a church, and hats must be taken off.